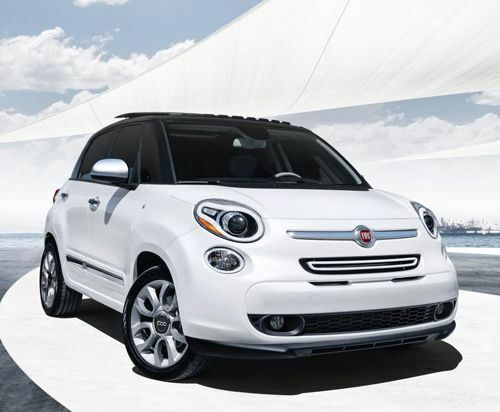 The 2014 Fiat 500L is a bigger version of what the Cinquecento was last year – but this is not as much a problem for a compact car as it can be for some of us. In fact, many automakers are redesigning seats and even seat belts so larger humans can comfortably sit in them, which may have something to do with Fiat adding 42 percent more interior space to the new variant. In one way or another, a lot of people are carrying more along as they drive. So is the 2014 Fiat 500L a stretch compact? That’s one way of putting it. We talked with Ariel Gavilan, Head of Fiat Brand Communications who told us while the Fiat 500 is 139.6 inches long (bumper to bumper) the 500L is 166.5 inches long – a full two feet has been added. Not only has the Cinquecento grown longer, but it is also taller and wider as well. The Fiat 500L is 70.2 inches wide and 65.7 inches high, compared to 64.1 inches in width and 55.2 inches in height of the Fiat 500. “We try to maximize the space in a relatively small car,” added Gavilan. This is something Fiat has mastered over the years. It is officially designated a “large car interior space,” by the EPA, he said. The 2014 Fiat 500L models are built on what Fiat refers to as a Small-Y platform. It has four doors providing a whole new look for the little Italian, which will arrive in four different trim levels next month, with a base price just under $20K including destination charges. The fun-to-drive compact comes with the 160-horsepower 1.4-liter MultiAir Turbo engine and a choice of two efficient six-speed transmissions. The base model sports premium Koni frequency-selective damping plus front struts and shocks in back. Daytime running lamps and bi-halogen headlamps are a rarity in a $20K car, not to mention 16-inch chrome-accented wheel covers and all-season tires. Spotter side mirrors, AC, power locks and windows, plus tire-pressure monitoring add to the vehicles value. Six-way adjustable front seats and 60/40-split rear seats feature fore-aft adjustment and recline, plus a tumble/slide feature for occupant comfort. A tilt/telescoping steering column, auxiliary power outlets, multi-position cargo area trunk panel and cap-less fuel intake combine with standard floor mats to complete the base package. The 2014 Fiat 500L Pop includes the Uconnect 5-inch touchscreen display with radio, voice command, Bluetooth phone and audio, text message reader, personalization settings plus USB and auxiliary ports. The compact car comes with seven standard air bags, reactive front head rests, theft alarm, child seat anchors and electronic stability control plus Hill-start Assist for safety. The Pop sells for $19,100 plus an $800 destination charge. The next trim level up adds standard 16-inch aluminum wheels, tinted rear glass, a front center console with armrest, a leather-wrapped square-in-circle steering wheel and shift knob with chrome accents, a choice of three dash colors, upgraded cloth seats and a six-speaker FIAT premium audio system kicking out 520 watts. The 2014 Fiat 500L Easy model is just $20,195 plus the destination charge. Aimed at those with a more active lifestyle, the 2014 Fiat 500L Trekking adds two-piece front and rear fascias with Grigio Chiaro (GC) graphite inserts, fog lamps, satin-finish on numerous accents, GC wheel arch and side moldings, GC recessed license plate and reflector surrounds. The Trekking trim level also sports 17 x 7-inch aluminum wheels with wide 225/45R17 all-season tires. On the interior, this model sports a painted instrument panel bezel and two-tone Nero/Marrone (black/brown) color scheme carried through the leather-wrapped steering wheel, door armrest bolsters, and low-back bucket seats with premium cloth upholstery. The 2014 Fiat 500L Trekking model is just $1K more at $21,195 plus destination charge. The 2014 Fiat 500L Lounge model proves you can have relative luxury in a more or less inexpensive car by adding premium heated leather front seats with power four-way adjust, power driver’s lumbar support, automatic dual-zone climate control and auto-dimming rear-view mirror with compass. That and a few of those Italian design touches for an extra $3K. Not exactly a bargain, but that depends on how much time you spend it the car, doesn’t it. It you do much intercity driving, adjustable seats can be worth their weight in gold. Notably all three upper trim levels come with a Premier Packages at no charge during the first year of US sales. The $1,700 value package adds other former luxury perks like ParkSense rear-park assist, ParkView rearview camera and a larger 6.5-inch touchscreen and navigation. Voice operation of navigation, radio and mobile phones plus Bluetooth phone and audio connection, text message reader, personalization settings, SD card reader, auxiliary jack and USB inputs. This promotion makes the 2014 Fiat 500L Easy and Trekking models an extraordinary value on an efficient new car with a lot of style and 120.1 cubic feet of interior space. Think one will work for you?